﻿The content will include presentations, theoretical reflections, case stories, workshops and great experiences. Meet world renowned speakers and be inspired. We explore the increasing diversity in the use of Digital Storytelling and seek to contribute to knowledge and understanding of the potential of digital storytelling in a variety of contexts. These cover educational purposes and health, leisure, recreation, activism, community building, planning, professional communication and reflection. 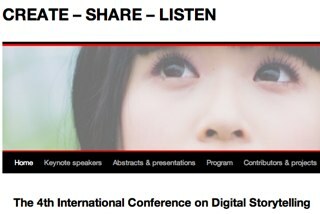 Contributions should aim at building knowledge about digital storytelling as a genre and its ambitions and potentials in society. We therefore welcome critical and well founded presentations of applications in various contexts, methods and expressions used and in what directions future developments might go. I haven’t been to the International Conference since the first one in Cardiff in 2003 so I think it’s time to show my face next year. See you there? I hope so.